Our Banana Bundt Cake is a hit! 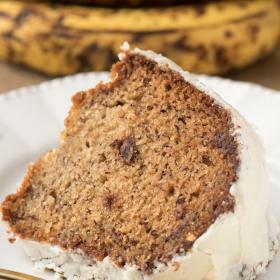 We use ripe bananas to make this banana cake recipe. This my husband birthday cake request every year. Make this easy bundt cake recipe for parties or just to use up your bananas before they go bad, it’s one of our favorite recipes for ripe bananas. Banana cake is super easy to make. 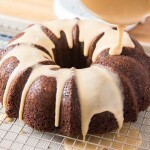 If you like banana bread, you’ll love this banana bundt cake recipe! I like to add a few chocolate chips to the cake batter. 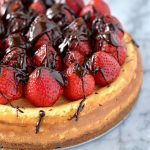 This really works well, I love how the little bit of chocolate cuts the sweetness. 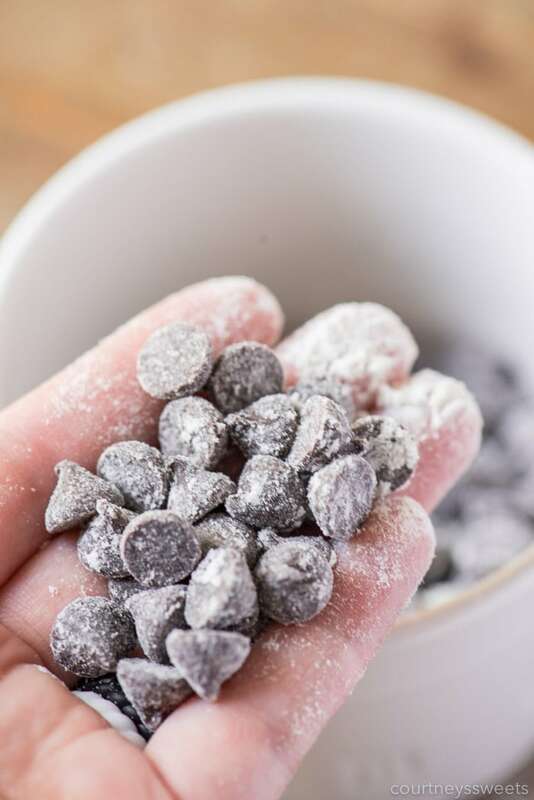 I use a semi-sweet chocolate chip, but if you want to have more sweetness you could stick with milk chocolate chips. While the cake is baking you want to make the cream cheese glaze. If it wasn’t a bundt cake a cream cheese frosting recipe would work well too! I just like pouring glazes onto bundt cakes. 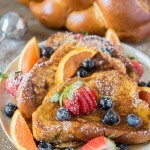 Our cream cheese glaze recipe is great for cinnamon rolls too! We try like to remove the unhealthy fats during baking. Some of our favorite swaps to use are greek yogurt, applesauce, avocado, and even pumpkin puree! We went with greek yogurt for this cake recipe. The only con about using greek yogurt in baking is the loss of probiotics. If you’re putting the yogurt in for gut benefits it won’t help much as probiotics are best kept cold and they do die off in the heat. 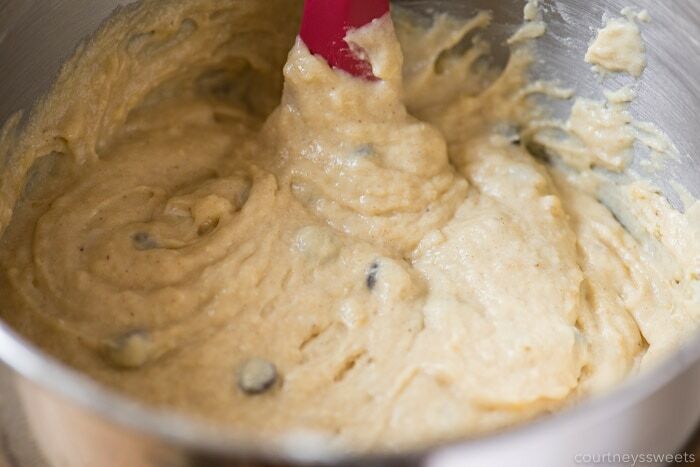 When adding chocolate chips to cake batter you’ll want to lightly coat them with a bit of flour. This will prevent the chocolate chips from sinking to the bottom of the pan. When using a bundt pan it’s important to use a nonstick spray or butter with flour. This ensures the cake comes out of the bundt pan easily. You also want to make sure the cake is completely done before you remove it from the oven. I usually check this by using a toothpick. 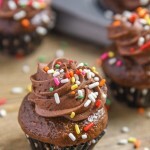 Cakes and brownies are typically done when a toothpick inserted in the center comes out clean. Speaking of bundt pan, we go with a fancy bundt pan instead of a traditional one. 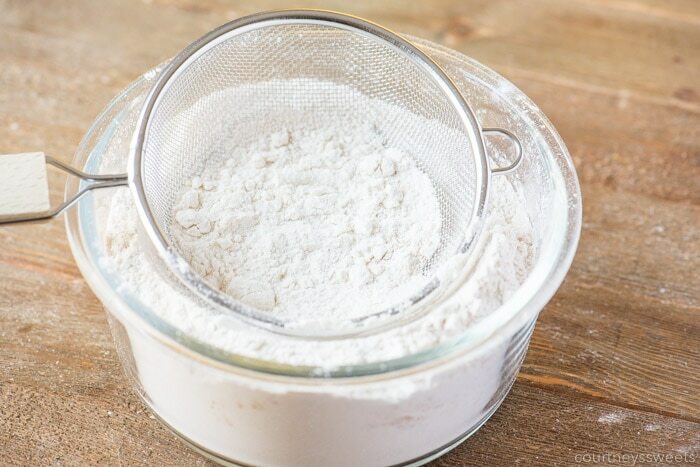 To prevent lumps in your batter and cake we recommend sifting your dry ingredients. If you don’t have a fancy sifter gadget you can use a mesh strainer, that’s what we use! To mash our bananas we like to use a potato masher, we also use this for avocados and have one for ground meats as well. These baking tips will surely help you bake up a scrumptious and stunning bundt cake. When is a banana ripe? A banana is ripe once the banana has brown spots, the more brown spots the sweeter it will be. This makes bananas a great sweetener in recipes too! This bundt cake does take quite a bit of time to cook. You’ll want to cook it for 40 minutes before checking it with a toothpick. It’s super moist and delicious and definitely worth the wait. Once you take the cake out of the oven you want it to cool in the pan on a wire rack before removing it. Once you remove the cooled cake from the pan you can pour the cake glaze on. I like to use my stand mixer to make the cream cheese glaze recipe, but you could also use a handheld electric mixer as well. To frost the cake I just keep it on the cooling rack and pour the glaze right on top. 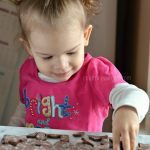 To keep it from making a huge mess I place the cooling rack onto a baking sheet with a silicone liner, you could also use parchment paper for easy cleanup. Our banana bundt cake is not only great for the bundt pan, you could also use muffin tins, cake pan, or even loaf pans. 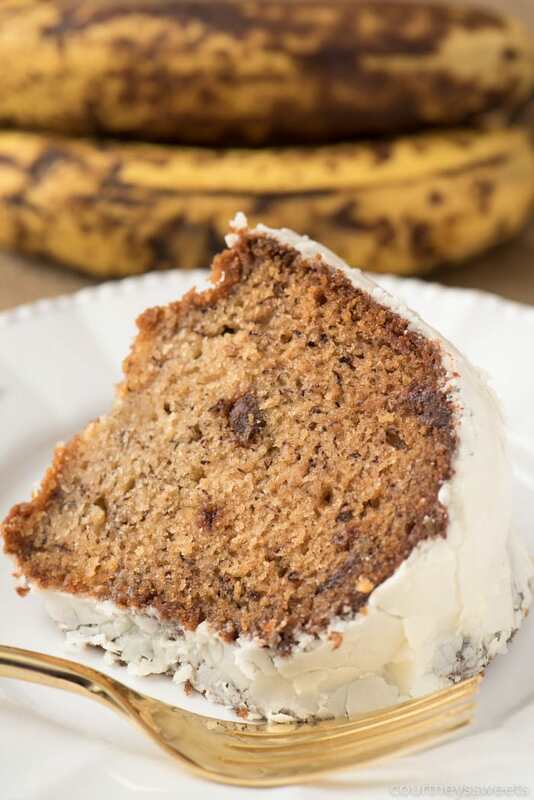 If you do not want to add the glaze you can do without it too, we just love how well cream cheese frosting goes with banana bread, so that’s why we paired our banana chocolate chip bundt cake with the cream cheese glaze. 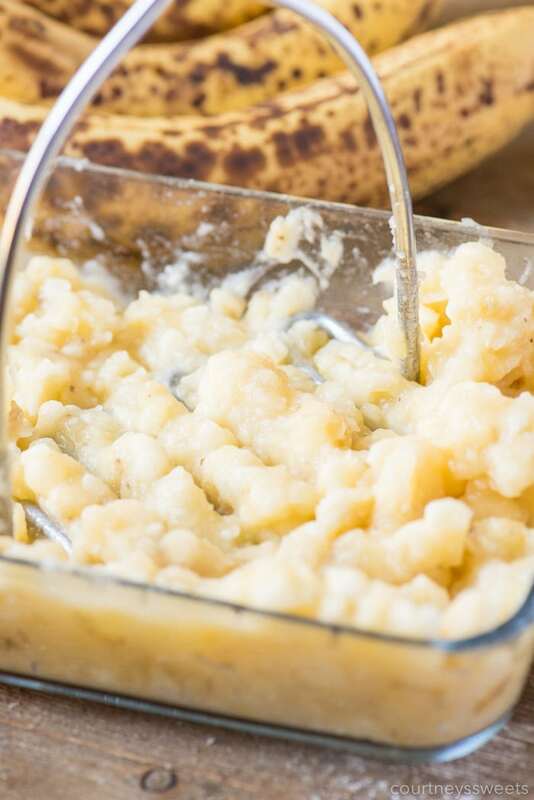 Here are a few recipes for the next time you’re asking yourself, what to do with ripe bananas? 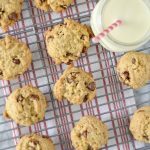 Banana Chocolate Chip Muffins – These banana muffins have a delicious streusel topping too. Banana Smoothie with Yogurt | Know Your Produce – This smoothie recipe uses fresh or frozen ripe bananas, it makes it extra sweet without added sugar. Strawberry Banana Muffins | Finding Zest – We love the combo of strawberry and banana and these muffins do not disappoint. Our Banana Bundt Cake is a hit! 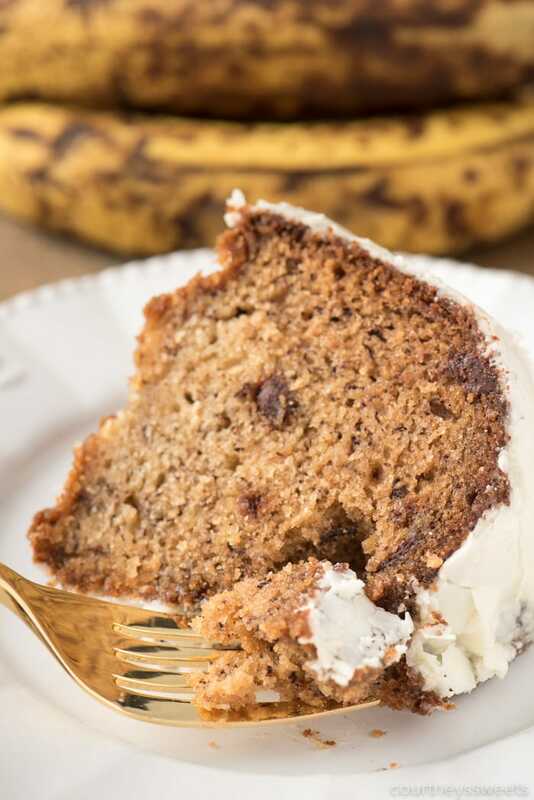 We use ripe bananas to make this banana cake recipe pure deliciousness! 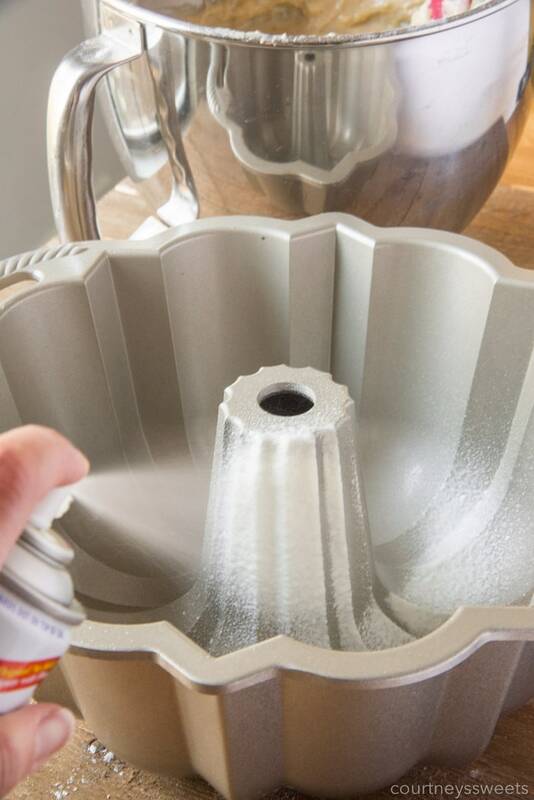 Spray bundt pan with baking spray and set aside. 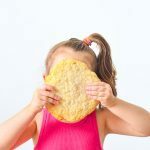 Sift together the flour, baking soda, salt, and cinnamon, and set aside. Using a stand mixer or hand mixer, cream butter for about 2-3 minutes. Add the sugar and vanilla to the butter, and beat until fluffy. Add in the egg one at a time and then add in the mashed banana, mix until fully combined. 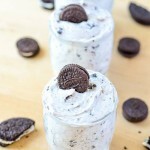 Mix in the sour cream and then slowly add in the dry ingredients, mix until just combined, do not overmix. Place in the oven and bake for 45-55 minutes or until a toothpick inserted into the center comes out with minimal crumbs. Allow the bundt cake 20 minutes to cook before removing from the pan, we place it on a wire rack and then remove and frost with cream cheese glaze. In a stand mixer beat the cream cheese until nice and creamy. Once fully combined, add in the vanilla and milk.